This article is about the business executive. For others, see Gary Cohn (disambiguation). Gary David Cohn (born August 27, 1960) is an American economist and investment banker who served as the 11th Director of the National Economic Council and was the chief economic advisor to President Donald Trump from 2017 to 2018. He was the president and Chief Operating Officer of Goldman Sachs from 2006 to 2017. Cohn is a registered Democrat, but has donated extensively to Republican politicians as well. He is currently a Visiting Fellow at the Harvard Kennedy School of Government. Cohn was one of the most influential voices in the Trump administration. On March 6, 2018, it was reported that Cohn planned to resign from his position in the coming weeks. He left the White House on April 2, 2018, after his replacement, Larry Kudlow, took up his post. Following his departure from the White House, Cohn became a Visiting Fellow at the Institute of Politics at the Harvard Kennedy School. He teaches alongside Sen. Heidi Heitkamp on how to confront the nation's most pressing policy issues. 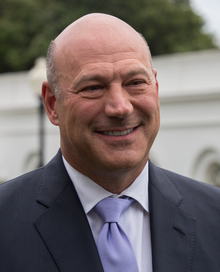 Gary Cohn was born to an Eastern European Jewish family, the son of Victor and Ellen Cohn, and was raised in Shaker Heights, Ohio. His father was an electrician who later became a real estate developer. Cohn was diagnosed with dyslexia at a young age, and attended four schools by the time he reached the sixth grade. Cohn studied at Gilmour Academy, and attended American University's Kogod School of Business between Fall 1979 and Spring 1982, where he majored in Finance, Real Estate, and Urban Development, and graduated on 16 May 1982 with a Bachelor of Science in Business Administration. Cohn started his career at the U.S. Steel home products division in Cleveland, Ohio. After a few months, he left U.S. Steel and became an options dealer in the New York Mercantile Exchange. He taught himself the basics of options by reading about it in the days between meeting the hiring manager and joining the New York Mercantile Exchange. Cohn was recruited by Goldman Sachs in 1990. In 1996, he was named head of the commodities department, and in 2002, he was named the head of the Fixed Income, Currency and Commodities (FICC) division. In 2003, he was named co-head of Equities, and in January 2004, Cohn was named the co-head of global securities businesses. He became President and Co-Chief Operating Officer, and director in June 2006. In late 2009, Cohn led a delegation from Goldman Sachs to meetings with the government of Greece, which included proposals (that were not adopted) to push debt due dates far into the future, "much as when strapped homeowners take out second mortgages to pay off their credit cards". Goldman Sachs had been scrutinized for creating or pitching products used by Greece to "obscure billions in debt from the budget overseers in Brussels". In 2010, Cohn testified to Congress on the role of Goldman Sachs in the financial crisis of 2007–2008. Cohn testified: "During the two years of the financial crisis, Goldman Sachs lost $1.2 billion in its residential mortgage-related business. We did not 'bet against our clients', and the numbers underscore this fact." Cohn's salary at Goldman Sachs was $22 million in 2014. He received $21 million in 2015. He received a severance package worth around $285 million – mostly in stock – from Goldman Sachs upon leaving to join the administration of Donald Trump. In the administration, he took a salary of $30,000, considerably less than nearly every other high-ranking administration official. On January 20, 2017, Cohn took office as Director of the National Economic Council (NEC) in President Donald Trump's administration, a position which did not require Congressional confirmation. By February 11, 2017, The Wall Street Journal described Cohn as an "economic-policy powerhouse", and The New York Times called him Trump's "go-to figure on matters related to jobs, business, and growth". With the confirmation of Trump's December 12, 2016, nominee for Secretary of Treasury, Steven Mnuchin, held back by Congressional hearings, Cohn filled in the "personnel vacuum" and pushed "ahead on taxes, infrastructure, financial regulation, and replacing health-care law". Had Cohn stayed at Goldman Sachs, some believed he would have become CEO when Lloyd Blankfein vacated that office. His severance package at Goldman Sachs amounted to $285 million. Additionally, Cohn sold a stake valued at $16 million in the Industrial and Commercial Bank of China, the world's largest bank as of 2017. Vice President Mike Pence, Gary Cohn, and Steve Mnuchin watch tax reform vote. Cohn supports reinstating the Glass-Steagall legislation, which would separate commercial and investment banking. Under the Trump administration, Cohn has been cited by the press as a supporter of globalism, and has been given nicknames such as "Globalist Gary" and "Carbon Tax Cohn". Along with Jared Kushner, Ivanka Trump, and Dina Powell, they have been referred to by opponents as the "Wall Street-wing" of the Trump administration. He was stated as being at odds with the populist faction that was led by Steve Bannon, when Bannon was White House Chief Strategist. Cohn withstood pressure to resign from his job following President Trump's speech blaming both sides, following white supremacist violence at the 2017 Charlottesville rally (Cohn was standing right behind President Trump as Trump made his controversial statement). Cohn did not resign at that time. On March 6, 2018, Cohn announced his intention to resign; the announcement followed Trump's proposal to impose import tariffs on steel and aluminum, and Trump's cancellation of a meeting with end-users of steel and aluminum that Cohn had arranged in an attempt to dissuade the president from the planned tariffs. He was replaced by Larry Kudlow on April 2. In August 2018, Bob Woodward published a book alleging Cohn removed a draft letter from President Trump's desk, so the President would not sign it. The letter would have canceled a trade agreement with South Korea, in addition to unilateral withdrawals from the Canadian and Mexican trade agreements. Cohn is married to Lisa Pevaroff-Cohn. They have three daughters, and reside in New York City. Cohn and his wife are founding board members of the New York University Child Study Center. The couple funded the Pevaroff Cohn Professorship in Child and Adolescent Psychiatry at the New York University School of Medicine in 1999. He financed the Gary D. Cohn Endowed Research Professorship in Finance at American University, his alma mater. In 2009, the Hillel International building at Kent State University was named the Cohn Jewish Student Center in recognition of a gift from Cohn and his wife. It is the first Hillel building built directly on the campus of a state university. Cohn has been a supporter of Reviving Baseball in Inner Cities, and has supported the nonprofit youth development organization Harlem RBI (now called DREAM) since 2011. At that time, Harlem RBI was given the chance to build its own charter school. Mark Teixeira of the New York Yankees and Harlem RBI director Rich Berlin asked Cohn if he could help them raise the capital they needed to build the school. On June 17, 2013, Cohn was honored at the annual "Bids for Kids" gala in order to raise funds for Harlem RBI. Cohn said in an interview that Harlem RBI is a project that is "very near and dear to his heart". Cohn is active as a trustee of American University and Gilmour Academy. In 2010, the Hospital for Joint Diseases at NYU Langone Medical Center named Cohn the chairman of the HJD Advisory Board. Cohn is a member of the Jewish Federation of Palm Beach County. Cohn is a member of the Treasury Borrowing Advisory Committee of the Securities Industry and Financial Markets Association. ^ Ruben, Greg. "Inside Trump World". Axios. ^ "Trump to name Goldman Sachs veteran, Gary Cohn, to head National Economic Council". The Washington Post. December 9, 2016. ^ Soergel, Andrew (December 9, 2016). "Goldman Sachs President Offered Top National Economic Council Job". US News. Retrieved December 9, 2016. ^ Campbell, Dakin; Jacobs, Jennifer (November 29, 2016). "Trump Meets With Goldman's Cohn as Dinner Set With Romney". Bloomberg.com. (see 3rd+4th paragraph after sub-headline "Goldman Carrier"). Archived from the original on April 19, 2017. Retrieved April 20, 2017. ^ "Gary Cohn – $68,642 in Political Contributions for 2016". www.campaignmoney.com. (2016 cycle selected by default, other campaign cycles choosable). Retrieved April 20, 2017. ^ "Gary Cohn". The Institute of Politics at Harvard University. Retrieved 2019-04-10. ^ Paletta, Damian (April 13, 2017). "Within Trump's inner circle, a moderate voice captures the president's ear". The Washington Post. ^ Kelly, Kate; Haberman, Maggie (March 6, 2018). "Gary Cohn to Resign as Trump's Top Economic Adviser". The New York Times. Retrieved March 6, 2018. ^ a b Reporter, Michael Levenson-. "As they head to Harvard, Gary Cohn and Heidi Heitkamp criticize shutdown - The Boston Globe". BostonGlobe.com. Retrieved 2019-04-10. ^ a b "The Real State of the Union". The Institute of Politics at Harvard University. Retrieved 2019-04-10. ^ "Watch: Goldman Sachs CEO Gary Cohn Says Mark Cuban Is Wrong On Bursting Tech Bubble, But Is He?". Jewish Business News. March 12, 2015. ^ "Hillel at Kent State Dedicates New Cohn Jewish Student Center". Hillel International. September 15, 2009. Retrieved March 4, 2016. ^ a b Hillel News (November 15, 2010). "Goldman Sachs Pres. Cohn Addresses Capital Friends of Hillel". Hillel International. Retrieved December 1, 2015. ^ La Roche, Julia (June 1, 2015). "Goldman Sachs' 2nd-most-powerful executive pulled an audacious move to get his 1st job on Wall Street". Business Insider. 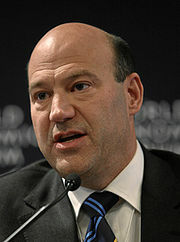 ^ a b c "Gary Cohn, Kogod School of Business Commencement Speaker". American University. ^ "Gary Cohn". Wall Street Journal. Retrieved March 24, 2015. ^ "Gary D. Cohn". GoldmanSachs.com. June 22, 2012. ^ Craig, Susanne (June 30, 2010). "Goldman's Cohn Is Next on Hot Seat". Wall Street Journal. ^ Michael Corkery (June 30, 2010). "Gary Cohn Testimony: Goldman Didn't Bet Against Clients". Wall Street Journal. ^ Cohan, William D. (April 2015). "Wall Street Executives from the Financial Crisis of 2008: Where Are They Now?". Vanity Fair. Retrieved March 29, 2015. ^ Crowe, Portia (January 22, 2016). "Here's how much Goldman Sachs' most senior execs were paid last year". Business Insider. ^ a b Egan, Matt (January 27, 2017). "Trump adviser Gary Cohn's $285 million Goldman Sachs exit raises eyebrows". CNN Money. Retrieved January 27, 2017. ^ Morrell (June 30, 2017). "Gary Cohn's White House salary is below nearly every other high ranking staffer". Business Insider. Archived from the original on July 1, 2017. Retrieved July 1, 2017. ^ Olorunnipa, Toluse; McCormick, John (June 30, 2017). "Gary Cohn Earns $30,000 a Year on Trump's Staff of Millionaires". Bloomberg.com. Archived from the original on July 1, 2017. Retrieved July 1, 2017. ^ Bindrim, Kira (July 1, 2017). "All of Donald Trump's White House staffers, ranked by salary". Quartz. Archived from the original on July 2, 2017. Retrieved July 2, 2017. ^ "Gary Cohn Is Leaving Goldman Sachs to Chair Donald Trump's National Economic Council". Forbes. December 12, 2016. Retrieved February 12, 2017. ^ Kelly, Kate (February 11, 2017). "Trump's Economic Cabinet Is Mostly Bare. This Man Fills the Void". The New York Times. Retrieved February 12, 2017. With crucial posts still vacant, Gary Cohn, a long-time Goldman Sachs executive, has become the president's go-to figure on matters related to jobs, business, and growth. ^ Limited, Alamy. "Stock Photo - Vice President Mike Pence, U.S. Treasury Secretary Steven Mnuchin, and Director of the National Economic Council Gary Cohn watch the U.S. Senate vote on the Tax Reform Bill". Alamy. Retrieved 2019-04-10. ^ "Cohn said to back Wall Street split of lending and investment bank". Bloomberg. April 6, 2017. ^ "American banks think they are over-regulated". The Economist. May 4, 2017. Retrieved May 11, 2017. ^ a b c Nathan-Kazis, Josh (April 17, 2017). "How Gary Cohn Became The Hated Jewish 'Globalist' In Trump's Cabinet". Forward. Retrieved April 17, 2017. ^ Blake, Aaron (April 17, 2017). "The derogatory internal nicknames of the Trump White House, ranked". Washington Post. Retrieved April 17, 2017. ^ "Trump adviser Gary Cohn reportedly considered quitting following Charlottesville". Jewish Journal. August 25, 2017. ^ Mangan, Dan; Pramuk, Jacob (March 6, 2018). "Gary Cohn resigns as Trump's top economic advisor". CNBC. Retrieved 6 March 2018. ^ Haberman, Maggie; Kelly, Kate; Tankersley, Jim (2018-03-14). "Trump Picks CNBC's Larry Kudlow as Top Economic Adviser". The New York Times. ISSN 0362-4331. Retrieved 2018-04-09. ^ Fabian, Jordan (2018-04-06). "Kudlow jokes he's 'gotta beat' Scaramucci's White House tenure". The Hill. Retrieved 2018-04-09. ^ Marshall Cohen and Jamie Gangel (September 5, 2018). "Read the stolen letter from Trump's desk reported in Bob Woodward's book". CNN. Turner Broadcasting System. Retrieved September 6, 2018. ^ Emily Smith and Carlos Greer (August 8, 2016). "Bethenny hurls her drink when she can't see Coldplay". Page Six. ^ "Hillel at Kent State Dedicates New Cohn Jewish Student Center". Hillel International. September 15, 2009. Retrieved December 1, 2015. ^ a b La Roche, Julia (June 17, 2013). "What Goldman's COO Gary Cohn Is Doing About Our 'Unfair' World". Business Insider. Retrieved April 5, 2015. ^ "2010 Hospital for Joint Diseases' Founders Gala Raises over $1.7 Million". NYU School of Medicine. November 10, 2010. Retrieved March 24, 2015. ^ "Goldman Sachs Group Inc-Bdr-Gary D Cohn". Bloomberg L.P. Retrieved April 5, 2015. ^ "Spring 2019 Resident Fellows". The Institute of Politics at Harvard University. Retrieved 2019-04-10. This page was last edited on 12 April 2019, at 20:58 (UTC).